If your system is not finding it easy with milk and its products, and you are thinking of living a diary-free life, you might want to consider switching to goat's milk. I guess the question running through your mind will be "how can this happen"? Well, after reading through this post, you might get all the convincing fact that you need. As we advanced in this world, and many people are becoming more health-conscious, many tends to deviate from consuming the normal cow's milk and rather looking for better alternatives. 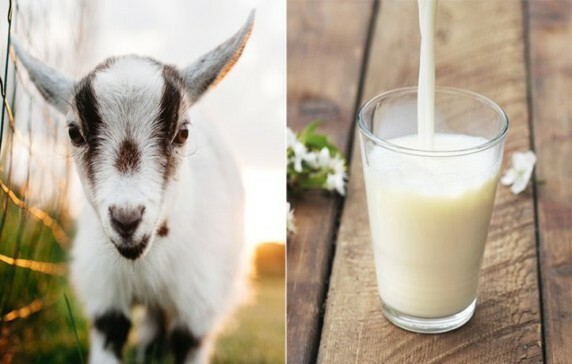 Let me show you some reasons you might love to give goat's milk a try. Though it is not completely free of lactose (the sugar found in cow's milk), but the lactose concentration in goat's milk is lower than that of cow's milk. But while the goat milk might not be a better option for those suffering from lactose intolerance, having less lactose content does make the milk easier to digest for those who the cow's milk normally cause stomach upset to. Another reason why the goat's milk is easier on the digestive system is that the fat globules are smaller. Once it gets to your stomach, the protein in goat's milk forms a softer curd, which helps your body to digest it with less irritation than cow's milk. The fatty acids found in goat's milk enhances your body, both inside and outside. It possesses moisturising qualities that keeps your skin soft, and the presence of vitamin A improves overall skin heath and fights acne. Goat's milk also has similar pH level to the human body, which means that it can be absorbed by the skin with less irritation while preventing bacterial attack. It also contains lots of lactic acid which gets rid of dead skin cells and brighten your complexion. Though we have been adviced to reach out for cow's milk in order to meet up our calcium requirement, but goat's milk wins the score as it contains about 33% of your daily recommended allowance of calcium. Meanwhile, cow's milk contains only 28%. Additionally, magnesium, iron and phosphorus are better absorbed in goat's milk. Goat's milk have been discovered to posses healing properties as olive oil, and regular consumption is recommended as a home remedy for magnesium deficiency, anaemia, eczema, and acne. Goat's milk also boos the regeneration of haemoglobin, which is highly beneficial for those suffering from osteoporosis. The high levels of selenium and zinc can also prevent neurodegenerative diseases like Parkinson's disease. Cow's milk contains 20 different allergens, and it is the most common allergies among children and it can persist into adulthood. This can result into allergic reactions like inflammation, abdominal cramps, hives, and colic babies. Goat's milk does not contain the protein responsible for most of these allergic reactions. Instead, it contains A2 casein, which does not cause inflammation and it makes goat's milk closest milk to the human breast milk. Goat's milk contains more medium-chain fatty acids. This is important because they are not stored as body fat and they provide energy boost. Their potency is linked to the prevention of heart disease and the treatment of many intestinal conditions while lowering your cholesterol and increasing levels of good cholesterol. I guess these health facts might be convincing enough for you to decide switching to goat's milk. Kindly make a contribution of your thoughts by using the comment below. Also use the share button below to get this message across to your friends and family on various social media.